How Do Energy Drinks Affect the Brain & Motor Skills? Energy drinks have become a very popular part of our culture, and many people substitute them for a morning cup of coffee or use them as a "pick me up" in the late hours of the afternoon. These drinks are extremely high in caffeine, a compound that has direct effects on the brain and on motor control. Although caffeine does have some beneficial effects, the levels present in energy drinks can also cause symptoms such as anxiety, tenseness, and difficulty with fine motor tasks such as writing. Energy drinks contain high amounts of caffeine along with smaller amounts of stimulants such as guarana and ginseng. The amount of caffeine found in energy drinks ranges from 75 to 200 milligrams per serving, and it is important to remember there are multiple servings in each can of most energy drinks. 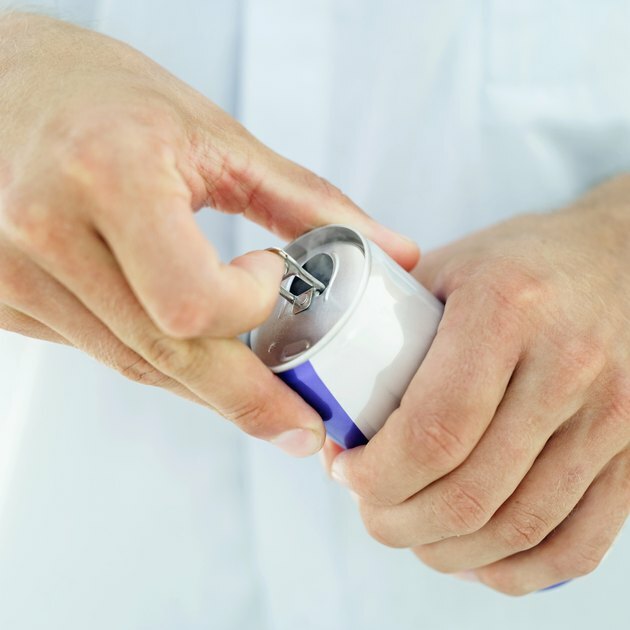 Energy drinks have significantly higher levels of caffeine than other soft drinks. According to the Center for Science in the Public Interest, Red Bull contains 80 milligrams of caffeine per 8.3 ounce serving, while Monster and Rockstar have 160 milligrams per 16 ounce serving. In contrast, Mountain Dew and Pepsi contain 54 and 38 milligrams of caffeine per 12 ounce can respectively. Caffeine acts by turning off receptors for adenosine in the central nervous system. Adenosine is a neurotransmitter that helps us to get to sleep and keeps us from being overly alert; when caffeine inhibits adenosine's receptor sites, the neurotransmitter no longer has an effect and we become more alert and aroused. According to the Gatorade Sports Science Institute, this can come across motorically as having tics, motor tremors, and having difficulty with fine motor control tasks such as writing. Caffeine also has effects on our peripheral nervous system, which refers to all neurological structures that are outside of the brain and spinal cord. A study published in The Journal of Physiology shows that caffeine facilitates self sustained firing of motor units, also known as involuntary muscle twitching, which can also impair fine motor control. A study performed in the Asian Journal of Sports Medicine definitively shows that caffeine significantly reduces reaction time. However, according to the European Food Safety Authority, the amount of caffeine ingested does matter: only beverages that contain at least 75 milligrams of caffeine per serving cause an improvement in reaction time. Research performed at the University of Colorado Boulder states that there may be more factors involved in the relationship between caffeine and reaction time. Individuals who have a high tolerance to caffeine may not show as much of a decrease in reaction time as those who are not regularly exposed to caffeine. People who are fatigued may also show more of an improvement in reaction time after consuming caffeine as compared to those who are well rested and alert. Caffeine has been shown to improve delayed recall, problem solving, and logical reasoning, especially in people who have high levels of fatigue. According to the International Food Information Council Foundation, daily consumption of 300 milligrams of caffeine can help prevent cognitive decline with aging in women. Research in the Journal of Alzheimer's Disease clearly states that while caffeine has greater effects on the cognitive function of fatigued subjects, it is important to remember that caffeine is not a direct cognitive enhancer. Caffeine causes an indirect improvement in cognition by increasing alertness, mood, and concentration, and as such may have differing degrees of effectiveness on individuals based on their levels of fatigue. Journal of Alzheimer's Disease: Is Caffeine a Cognitive Enhancer?